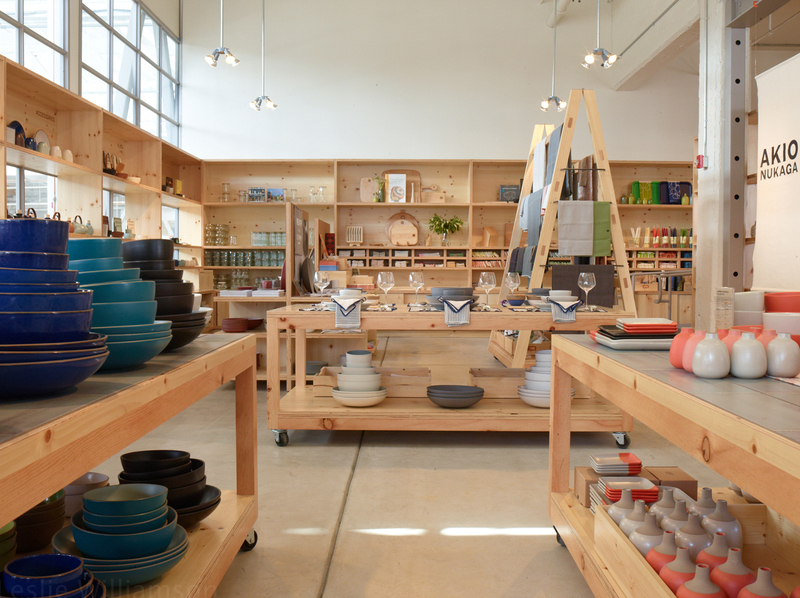 Heath Ceramics recently opened a factory and retail location in San Francisco and partnered with Blue Bottle Coffee to open a cafe inside of the 60,000-square-foot former industrial laundry. Thanks to the keen design eye of Commune—who helped with the look and feel of the interiors—and structural wizardry of Charles Hemminger of hemmingerarchitects—who helped refine the architecture—Heath has a new home at 18th Street and Alabama befitting its wares. "We needed more space," says Heath co-owner Cathy Bailey, who had a studio in the neighborhood years ago. "The original building in Sausalito was built in 1959 with the agenda to be a dinnerware factory. Over the years, it's grown and we have no more space. The difference between the new Heath and the old Heath is that we do everything ourselves—sell directly, manufacture, and design in-house. We didn't want to build way out in the valley, away from everyone; we wanted to stay close to customers, in a vibrant environment." Heath's new San Francisco home will eventually produce all of the company's tiles. The structure was built in 1917, with additions in the 1940s and 1950s. For most of its near 100-year life, it was an industrial laundry. One of the challenges Bailey and her husband, co-founder Robin Petravic, faced was finding an appropriately zoned building in the city. The neighborhood in which the factory is situated has seen a fair share of changes throughout the years, moving from industrial to residential and commercial. Condos and retail are common now, but San Francisco kept the original zoning in place so that some parcels would retain their original character. The design team retained the raw character of the structure but worked to ensure that natural light floods the interior. "The change was pretty radical, although what we have today is a fairly simple space," says Bailey. "It's all about the light and transparency now." To somewhat of a fishbowl effect, the cafe, retail store, and seating area wrap around the glass-walled kiln area. "Our experience in Sausalito was that people wanted to see how everything is made, but might not have the time to do a tour. We thought that everyone should be able to see that part of story." Heath plans to move tile production to the San Francisco factory and will continue to make all of their slip-cast pieces—such as dinnerware, shown here—in Sausalito. "In this showroom, it's the first time that we've been able to show the tile, have people interact with the tile, play with it, see what's on each side, and have access to boards to experiment," says Bailey. A series of exhibitions is set to take place in the San Francisco factory. Heath typically hosts three two four each year featuring the work of artisans whose work resonates with the company. Garza Marfa opens September 29 and closes November 11. James Garza designed the Oval Saddle chairs in the foreground. Ohio Design made the table and benches in the background using materials reclaimed from the renovation. Wood sculptor Alma Allen made the coffee table. Here's the cafe space, which is set off to the side of the building. The kiln (currently under construction) will be behind the bank of windows in the background. We love how the building hosts a multitude of uses: a social space for the neighborhood, retail, and manufacturing. It's also two local businesses supporting each other—a customer might come in for a coffee and come out with a new place setting, and vice versa. Heath's collaboration with Blue Bottle began with the need for a cup. "We had a nice relationship with Blue Bottle from the start," says Bailey. "When they were opening their space at SFMOMA, they wanted to use Heath but we didn't have an espresso cup so we worked with them to make the perfect one." Heath's Coupe line cup and saucer are shown here. The cafe's accent wall features 4" x 4" and 4" x 8" tiles in a stitch pattern, with a mix of glazes: Shade, Shade light, Slate #2, Shark, and Blue Lake. The seating area is elevated a few steps up from the cafe. In the community space, a mural details Heath's decade-by-decade timeline. "We wanted to give everyone a sense of history while standing in the space," says Bailey. Here's the storefront. For more about Blue Bottle Coffee, please visit bluebottlecoffee.com.